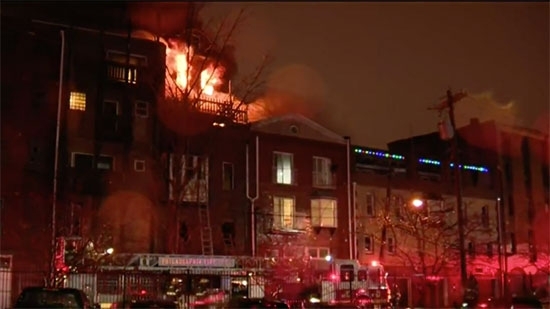 An early morning two-alarm fire in Old City has displaced 3 residents and destroyed their building. The call came out around 3:30 a.m. Sunday morning, 1/20, for the 300 block of North Front Street. The four story building which included some apartments was evacuated. Firefighters could not go inside because the second floor collapsed causing dangerous conditions. Instead they kept pumping water on the structure. The fire was contained to just that building. No was was injured. The cause of the fire is not known at this time. An elderly woman has died after a house fire in Chestnut Hill on Saturday night, 1/19. The fire started around 9:30 p.m. on the 500 block of West Moreland Avenue. There were heavy flames coming from the first and second floor on the home when firefighters arrived. It was quickly brought under control within a half hour. The woman was taken to Einstein Medical Center where she was pronounced dead. The identity of the woman has not been released. There were no working fire alarms found in the home. Police and SWAT responded to a South Jersey motel early on Sunday, 1/20, after the reports of shots fired. It happened around midnight on the 800 block of Crescent Boulevard at the Motel 6 in Brooklawn Camden County. Officer found a 30-year-old man shot three times in the chest and back. He was taken to Cooper Medical Center. No word on his condition.